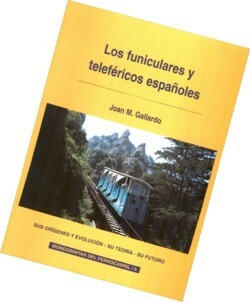 With a long introduction, the author summarizes the evolution of the concept of Funicular and of “Teleféricos” later to describe each and every of the existing facilities in Spain for public service, besides all those not realized projects and that the author located, organized all of them for areas in which these means of transport had major presence, and a set of solitary them in his environment. From the first “Funicular del Tibidabo”, constructed already one century ago, up to those of the last generation (Funicular of Vallvidrera, in Barcelona, or the most recent, that of Bulnes, in Asturias) the technology and the history of this system of transport, minority but effective to save big differences, complements itself in the book with the history of the teleféricos constructed in Spain and the projects, some rather Utopian, that tried to be constructed. Definitively, a good book that it does of reference to the whole branch of the interest to the railroad that is interested by more curious and less common aspects of the relative thing to the railroad. Size: 17 X 24 X 1,7 cm.